Walking up Wenceslas Square towards the top, turn right into Ve Smeckach Street and walk 75 metres along. Paddy's Bar is on the right-hand side. 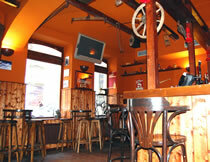 Paddy's is a small bar on Ve Smeckach, a side road off Wenceslas Square. This area of Prague is a popular place for stag parties to stay and for its nightlife; several other bars, clubs and Darling's Cabaret are nearby. Paddy's has a heavy wooden décor and a couple of TVs dotted around the room, but its main draw is the cheap prices it charges for beers, wines and spirits. Despite its name, Paddy's is not an Irish bar, more a small international stag friendly bar. So if you are in this part of Prague and looking for a few cheap beers to set you up as you make your way around town, it may be worth popping into. For larger, usually more lively bars, head for Nebe Bar, then Rocky O´Reillys, one road down from Paddy's on Stepanska street. But you never know, you might find you head back to Paddy's Bar for a nightcap later on!